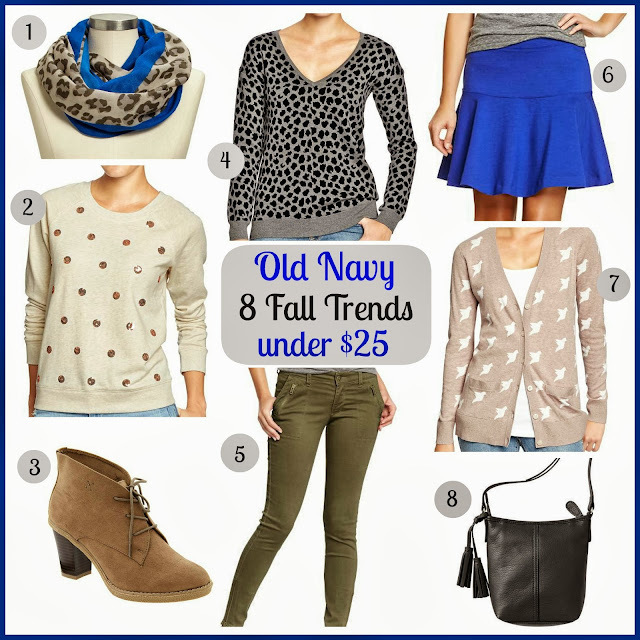 Tracy's Notebook of Style: Old Navy Sale - 8 Fall Trends under $25!! Old Navy is taking a whopping 30% off their already affordable prices and I chose 8 fall trends to shop right now! Some of the items may or may not already be in my shopping cart. 1 Infinity Scarf $11.85 The perfect accessory combines the leopard trend and cobalt blue. 2 Embellished Sweatshirt $14 The "fancy" sweatshirt is so popular for fall (and hopefully beyond). 3 Boots $22.71 One of the boots of the season, wear this with jeans or dresses. 4 Animal Print Sweater $17.50 Leopard print is bigger than ever this season and looks updated in this color combo. 5 Rockstar Zip-Pocket Pants $22.40 A motocycle- inspired zippered pant looks cute paired with the latest boots. 6 Fit and Flare Skirt $18.85 The newest and most flattering skirt trend and again in the blue hue. 8 Crossbody Bag $17.46 This Coach inspired bag, right down to the tassel is the nicest crossbody bag I've seen at this price. It's actually bigger than it looks and I picked it up in Burgundy (before I ordered the Phillip Lim bags). *Items are shown with discount already applied. Oh that purse is so very Coach-like! Great picks! I SO wanted that royal blue skirt to fit me. I tried it on the other day, and it was just...NO. It's so cute online and on the hanger, so I was really bummed when it fit awkwardly on me. I still managed to snag a piece or two from there, at a bargain of course! Oh no Jackie-too bad about the skirt, I'm sure you found some equally awesome things, I'll watch for your upcoming posts!